Mama could’ve made a mini-me from that leftover fur! This entry was posted in Dogs and tagged grooming dog, leftover fur. Bookmark the permalink. That’s another sure sign of the coming of spring, isn’t it? The shedding of the winter coat? Dixie Rose is up to the same tricks, and the result is here, there, and everywhere! Shelties “blow coat” once or twice a year, so at those times, the fur is everywhere! They can’t help it. About all we owners can do is brush them as often as we can (or as they’ll tolerate! ), and make sure we keep the furs picked up. Dallas has an exceptionally heavy coat (thanks to his sire), but he always gets compliments on it! Bwhahahahahahaha! OMG Dallas, this made me laugh!!! How ADORABLE you are!!! Thanks so much for the laughs and the sweetness! And tell Mama I said, Have a grrrreat Wednesday! Thanks so much, Ron. Glad we were able to tickle your fancy this morning! Wow, Dallas. You could’ve had a little friend to play with! Heh Heh, good one, Monica! Do you know of any place that accepts leftover dog fur and uses it for a worthwhile cause?? Wow. Dallas. No wonder you are so hot. Oh, John, if you only knew. He drapes himself all over the air conditioning vents or lies on the basement floor much of the summer months. Ha ha ha. I’ll bet. 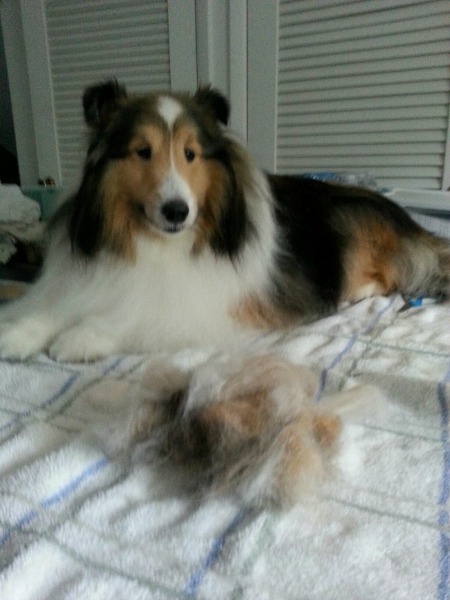 Our neighbor has a Sheltie that she has clipped for the summer. Great idea, but I know nothing about spinning! Still, it would be nice to have something to remind me of him when he’s no longer here. None of them live forever, you know. Sigh. Thanks, Audrey. I’m just fortunate he doesn’t shed all the time!! Oscar, our pug, sheds year round. It’s hard to get a handle on. A full-time job. They do?? Oh not Dallas — and he’s a real chow-hound! Dallas is such a handsome dog! I just groomed my collie, bathed him, and gave him a bit of summer hair chop, ha ha. He still sheds, sigh. Dallas still sheds, too! But at least his coat is thick and beautiful — it’d be so sad if it only grew in tufts and made him look mangy!